Admit it, getting a haircutt is a mood altering experience. Choice Cutts Barber/Styling serving Durham (downtown in the loop) and surrounding community. 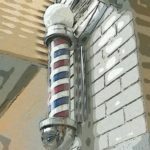 Where barber/styling is an art and customers are patrons.